So what else did the 70's have to offer besides the brilliance of Parvarish which I think has now been captured adequately? 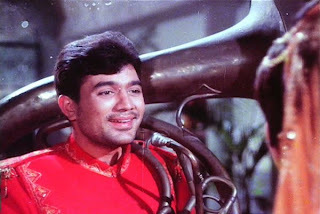 Of course, early 70's were as I understand it, the height of Rajesh Khanna mania. I haven't figured out why yet! Dude's a nice actor, can be charming .. but letters in blood, really? Here he is in Sachaa-Jhutha as a kind-hearted simpleton. Helen item numbers is something that Parvarish lacks and that I haven't therefore discussed. Here she is, trapping a fly in Inkaar. That foxy woman! 70's was also a time for different cinema, or I should say, not-totally-batshit-actionpacked-masala. Here's a screencap from Achanak, which I really need to rewatch because it's very short and is a poetic, interesting Gulzar movie about taking lives and the paradoxes of it. Young Farida Jalal as Vinod Khanna's nurse was suberbly adorable in this. For more on Gulzar, I refer you to Old is Gold's 70's week post about the director/lyricist. 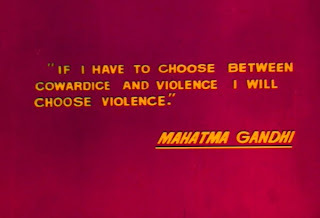 This quote appears ahead of Mera Gaon Mera Desh, and reflects the change from the gentler films of the past to the more violent, action-filled masala of the 70's. Mohandas Karamchand Gandhi, what would you think about being quoted to fuel the career of Bollywood's He-man, Dharmendra? Well, I'm sure greater crimes have been made citing Gandhi. Speaking of Dharam, check out DG's post about his 70's career. 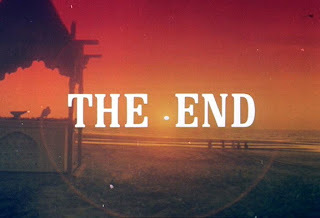 And so we ride off into the sunset..
--but wait, you Hindi film-centric nuisance, you may yell! What about Tamil/Telugu/Malayalam etc films? Really enjoyed your 70s week posts, and learned a lot as well. I definitely need to see 'Achanak' soon. Achanak is pretty interesting, and also really short. It's 98 minutes, length of a Hollywood film! 70's week: Villains, action, general badassery. 70's week: Music and song picturizations. 70's week: Romance and awesome heroines. 70's week: The fashion, the decorations, are wah! Saat din, Abhay ke saath - my week with Abhay. God of disinterest - Naan Kadavul. Indian - a big film deserves a big review. A long long time ago, in a galaxy far far away. Kyyhkyläiset - the lovebirds. Maine Pyaar Kiya. Like a big serving of kulfi - Oy!